Start signing life insurance papers because the manic, unrestricted, deadly Group B is back. 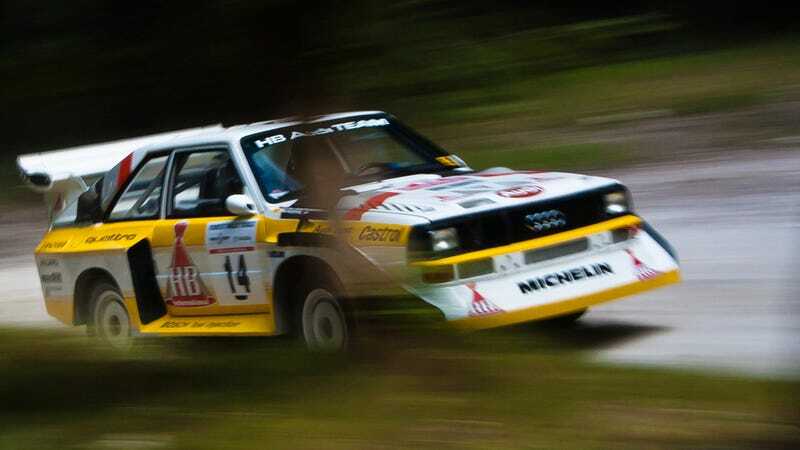 Only the Quattros, Lancias, Fords, and Peugeots from rallying's golden age never really left. On 25-26 August, there will be a five-venue rally in Cheshire (that's in England for those of you who don't watch Top Gear) open to Group B cars. There are already over 60 entrants, reports EVO Magazine. Even with its associated deaths, Group B didn't have to get cancelled – the problem wasn't the cars (though they could have been made much stronger), but the fans lining the rally courses, which were too long, too tiring, and too dangerous in the first place. Many of the cars migrated to rallycross, where they'd drive in half-dirt/half-tarmac circuits. No spectators to crush, no cliffs to jump, no trees to hit. They've been running since the ‘80s and there's plenty of race footage online. On top of all that, for years now Group B cars have run at the annual Goodwood Festival of Speed along with all the other classics of rallying's history. We've even ridden along in one. While the Rallye Groupe B this August will be the UK's only multi-venue Group B event, it's not like the cars have been in hiding since they were banned in '86. That's not to say that we're complaining, and we can't wait to see the cars run. We've made a little gallery of some Group B excellence from the recent revivals to get you excited, too.